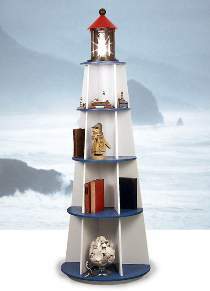 Lots of shelf space so you’ll have plenty of room to show off your favorite nautical collectibles! The main section of this striking furniture piece is made from 1/2" plywood! The top is made from 3/4" pine. Our large plan sheets include FULL SIZE patterns for all pieces. Measures 70"H x 24"W x 15"D.